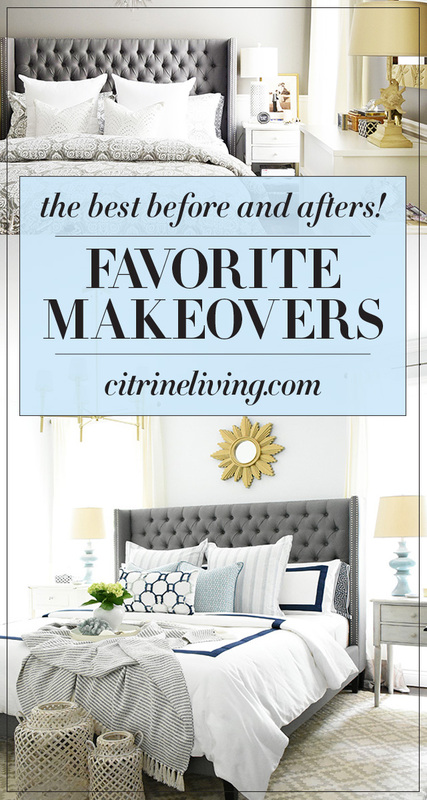 FAVORITE MAKEOVERS - GET MOTIVATED TO DECORATE! I’m back this week with Part 2 of my favorite makeover series – I’m a little later than I thought I would be, but better late than never, right?! I took a small break from the blog last week, while we were away on vacation and at a dance competition for out daughter. I was planning to get this up while we were there, but it was just so busy! I shared five favorite picks in the first instalment of this series, and you’ll definitely want to see them if you haven’t yet! You can click here to read all about them in My Favorite Makeovers Part 1. 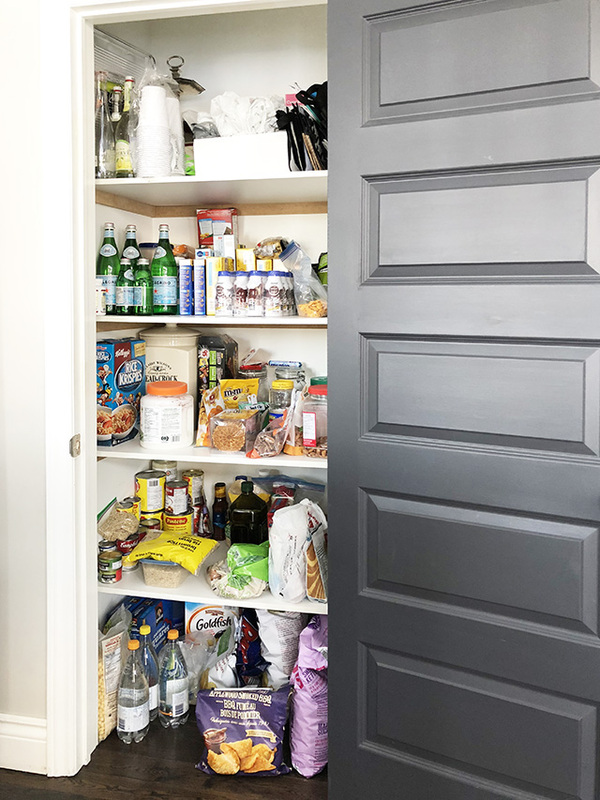 From our kitchen to our daughter’s bedroom and our backyard patio, there are some pretty dramatic changes that have taken place over the past eight years we’ve lived in our home. 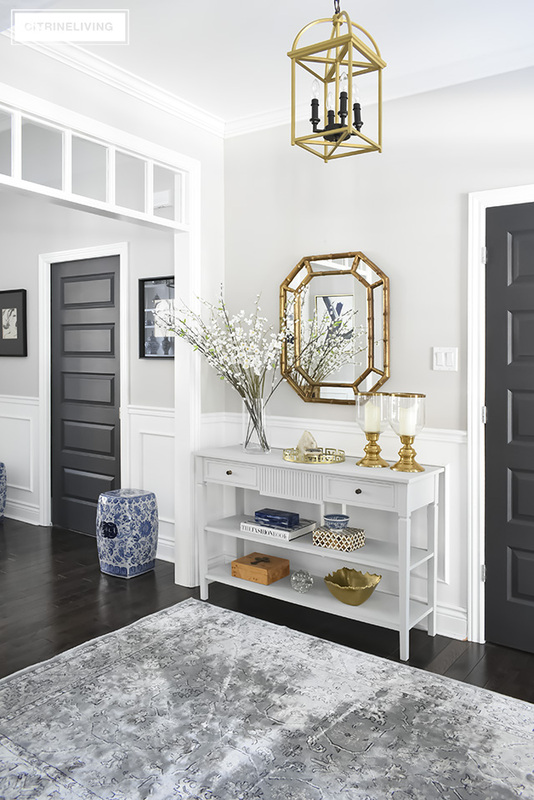 Today, I’ll be sharing five more favorite makeovers from our home, plus an extra one from our friend’s home, that I just had to throw in – it was too good of a makeover not to include, and probably the most dramatic before and after of all of the spaces I’m sharing in this series. I always love a great makeover and trust me when I tell you, it does not always take a lot to transform a space. 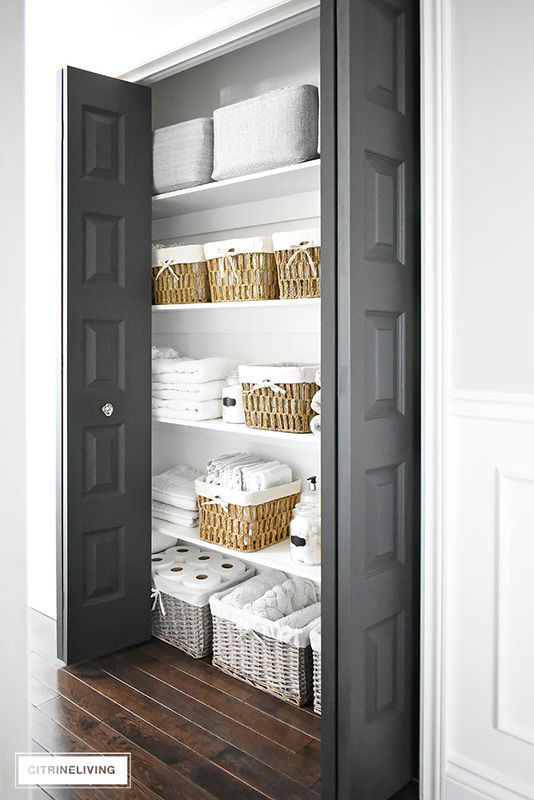 Sometimes a simple coat of paint in a completely different color is all you need to create a whole new look. Come on in and have a look around – tell me down below which one is your favorite makeover! 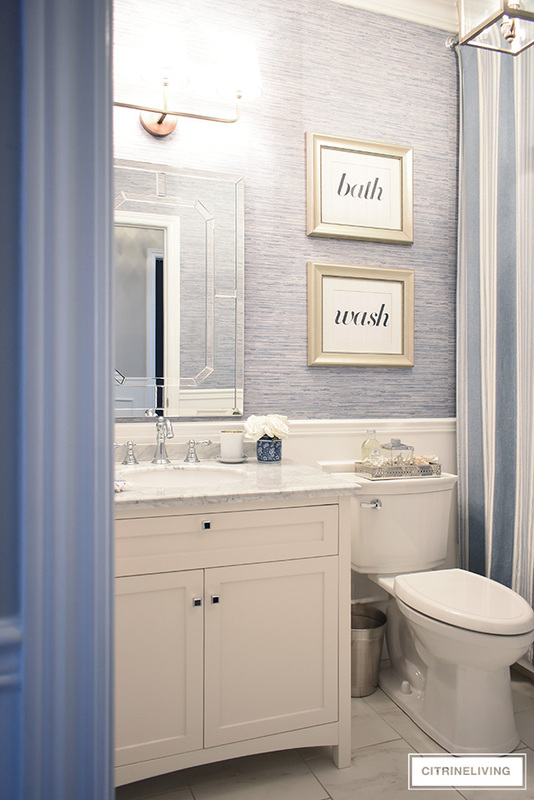 Let’s get the ball rolling today with our kid’s bathroom – definitely one of my favorite makeovers. This space has been gradually changing over the last couple of years and I’m so happy to say we finally completed our vision this past winter. I loved the before, especially the black painted vanity, which was my former childhood bedroom desk – it held a lot of sentimental value and moved with us from our previous home as well. However, this is a small bathroom, and it’s shared by two growing kids. It’s also the main bath in our home for guests as well. It needed storage for everyone’s needs, and it also need a more ‘complete’ look. Below is a transition phase of this space – it went from having dark, warm grey walls, to light blue walls and finally, to faux blue grasscloth wallpaper – which, I hung all by myself! The wallpaper was the best choice we could have made and brought this bathroom up a few notches. 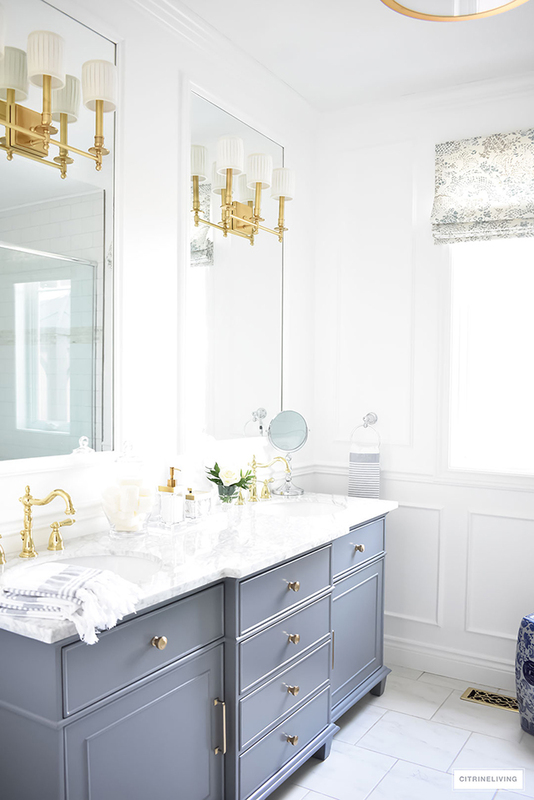 We added a beautiful white vanity with a grey marble counter top, brass lighting and an eight foot shower curtain to create some drama. The look is coastal chic and we all love it. 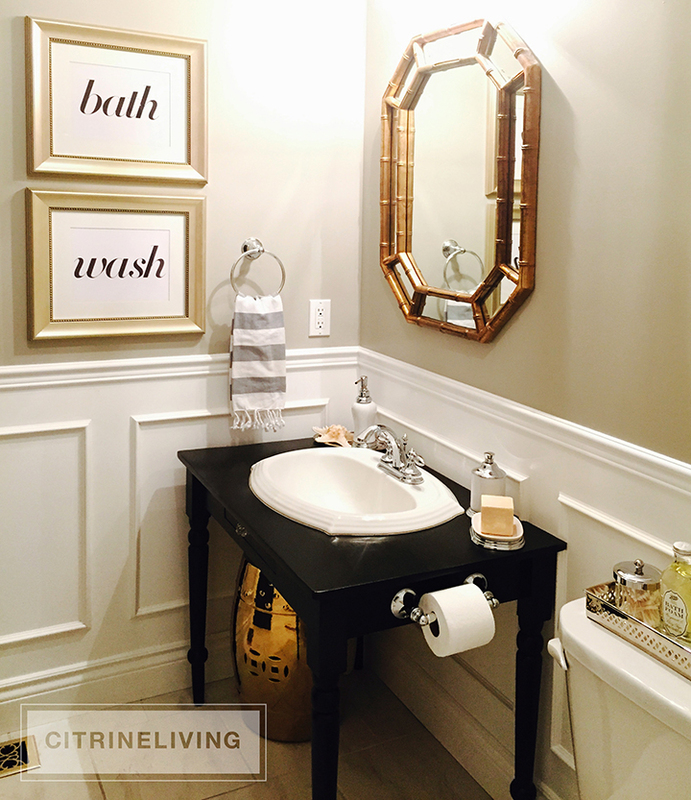 Even the toilet got swapped out to complete the look, and we couldn’t be happier with the results! 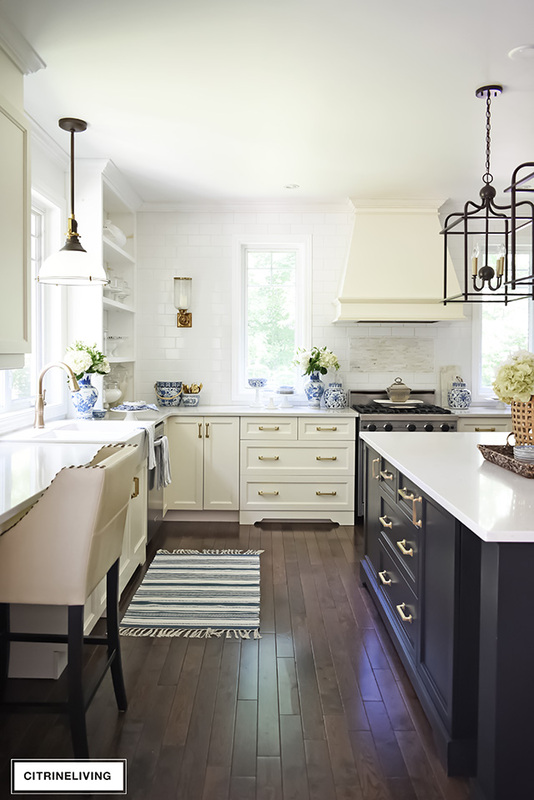 Click here to read all about this room and see more transition phases this space went through. 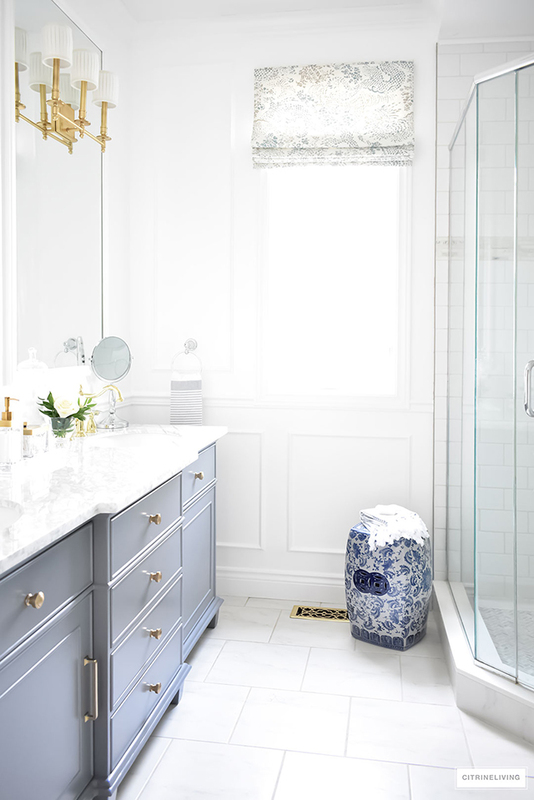 Next up – our master bathroom! This one was a BIG one for me. When we built our home, we tried to keep everything on as tight of a budget as possible, and I had found a vintage dresser for very little money to use as our vanity. I sanded it down and painted it a gorgeous glossy seafoam color to play off the play green-grey walls. I loved it so much and the look at the time was exactly what I had envisioned. My vintage chandelier was the perfect compliment to this piece and I loved the soft feminine feel of this space. That changed with time, as our tastes often do, and we were feeling the need for a big change, but again, keeping it simple without major renovations. 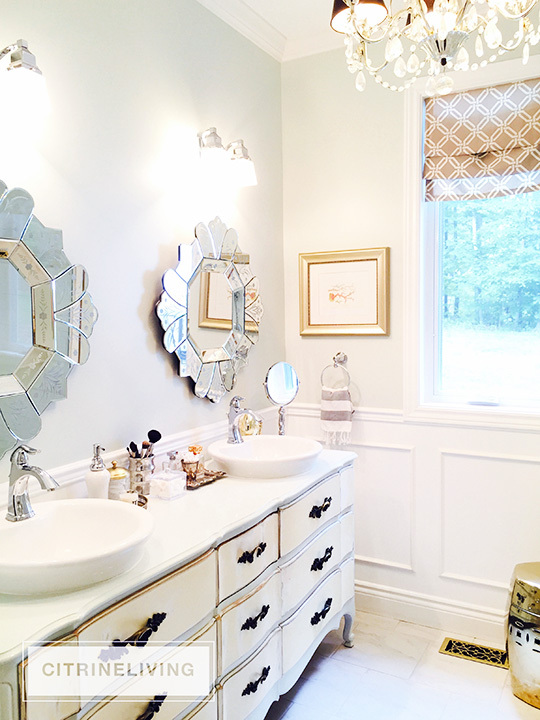 The vanity was really getting worn – that’s the trouble with old furniture pieces, they do start to ‘break down’… we still wanted somewhat of a glamorous look, but this time with a little masculine edge. 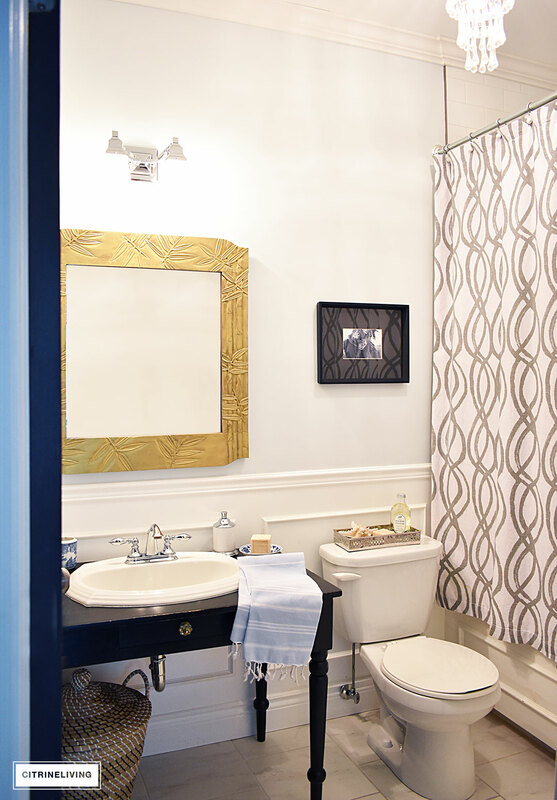 I knew brass was most definitely in the picture for this space, so we went with all brass fixtures and hardware. 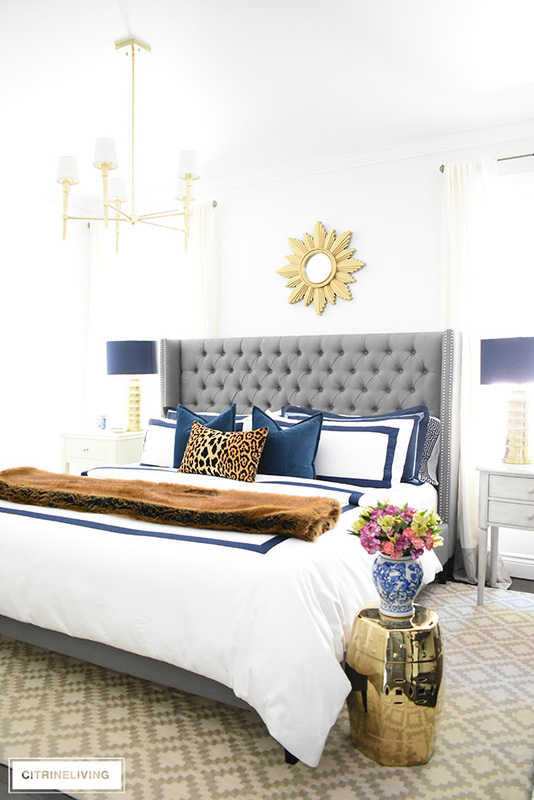 Paired with the cool greys and bright whites, we now have the lux feeling of an old European hotel with modern flair…one of my favorite makeovers without a doubt! We absolutely love this space so much more than before, and the biggest game changer was installing the oversize mirrors, which enlarged the space visually with their dramatic scale. It was a small splurge to have them custom ordered, and a little tricky to install, since the walls are not perfectly square. We did it in the end, and trimmed them with molding to play against the wall moldings that we added, which also enhance the vertical space in here. Totally in love with this makeover! 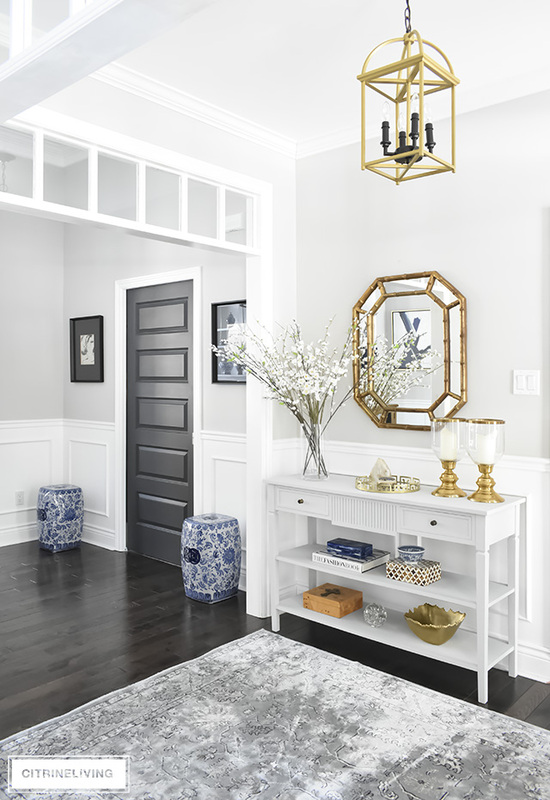 Click here to read all about this One Room Challenge space that we tackled last year, and see the full progression from beginning to end. 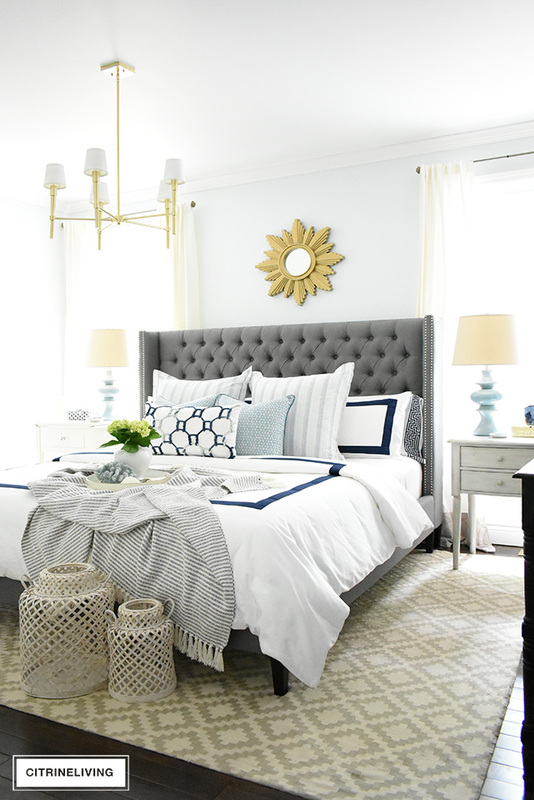 We took our master bedroom from a rich, deep grey to a light and airy pale blue a couple of years ago, mainly because we wanted more light in our room. We loved the cozy enveloping feeling it previously had, but the two windows face north, and northern exposure yields very little light sometimes, especially with this wall color. There is no direct sunlight in here at all, and during certain times of the year, it can be extremely dark. We opted to lighten and brighten, and since the change a few years back, we love our bedroom even more now. You can read all about this beautiful grey space here, which has a curated and collected look, that I still love today. If you’re a regular reader, you know each season our bedding either gets an update, or gets swapped for a previous set. I love to switch it up in Spring and Fall, and sometimes, I’ll even throw Christmas into the mix, like I did last year. Below is my most recent summer look, with a coastal, laid-back look. You can see more of this latest look here, and if you’re curious to see all of my different bedding looks, you can head to my SHOP MY BEDROOM page here. OK – I know this is not a room makeover, and probably falls under ‘reorganization’ more, but I couldn’t leave this one out, simply because it has totally changed my life! I am very serious about that! This little kitchen pantry of ours used to give me the biggest headaches imaginable. It was a huge unorganized mess, and the anxiety I would get each time I’d open the door became unbearable…so, I hunkered down by editing, purging and organizing in a couple of days for a very small amount of money. You will want to read this one, I promise! Click here for the full reveal! Tell me the after isn’t glorious?! 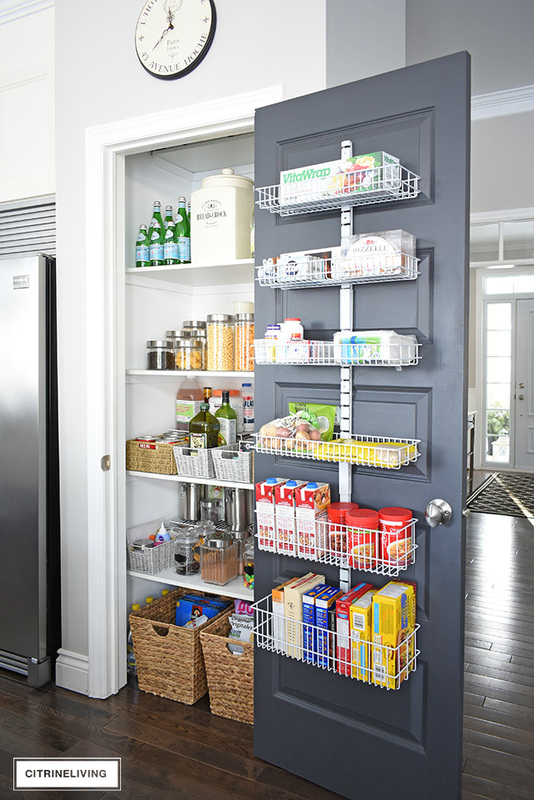 Small, but mighty, this little pantry is as organized and clean today as when I first made it over. It forces me to keep everything neat and tidy, and we are also buying less to fill it up. Everything has it’s place and we truly only buy what we need, since each basket and shelf is designated for something specific. I love it and I love how much more simple it has made my life when I’m cooking or looking for snacks. We all love it, in fact, and everyone in the family keeps it neat…could I possibly ask for more? Most definitely one of my favorite makeovers! This is another favorite makeover that I still get so excited about! It was super quick to turn around and I achieved a completely different look for next to nothing. 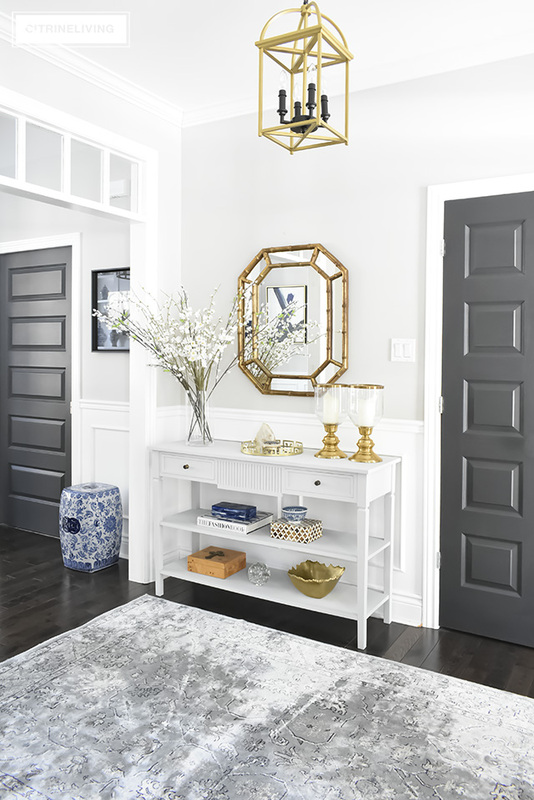 This one came to me on a total whim one day, when I decided it was time to give our console table new life with a fresh coat of chalk paint…which also prompted me to swap out the mirror and buy a new rug. I found the rug at HomeSense for a steal, I already had the mirror that ended up in here, and for less than $300, we had a brand new entryway that looks like a million. Oh, and the light fixture was our previous one over the kitchen island, which I had moved here a while back as well. Although this space is not in our home, I had to include it because it is such a dramatic makeover with truly incredible results. The before and after is so drastically different, it’s almost impossible to imagine that this is the same bedroom. We took this space from dark and dated, to bright, airy and modern. I think this favorite makeover takes the cake for me! 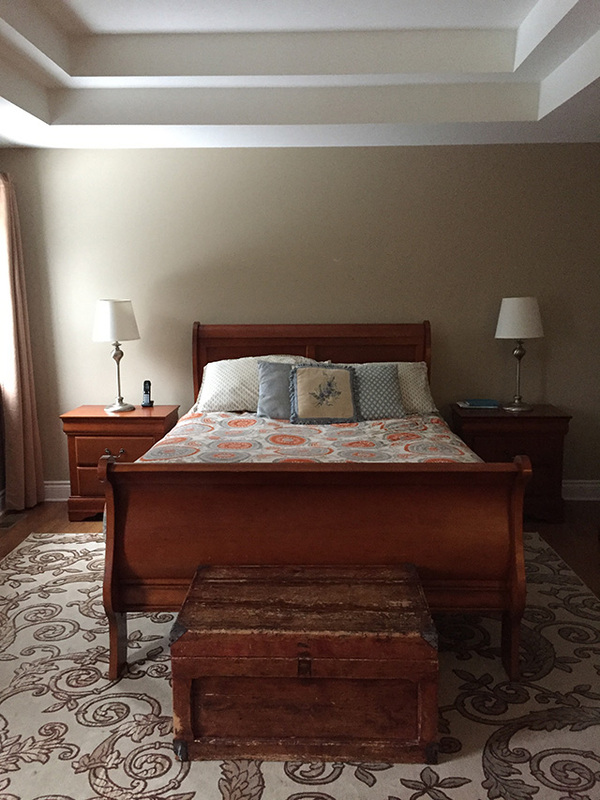 Below is the before with dark drapes, beige walls and a cherry wooden bedroom set that did absolutely nothing for this space. 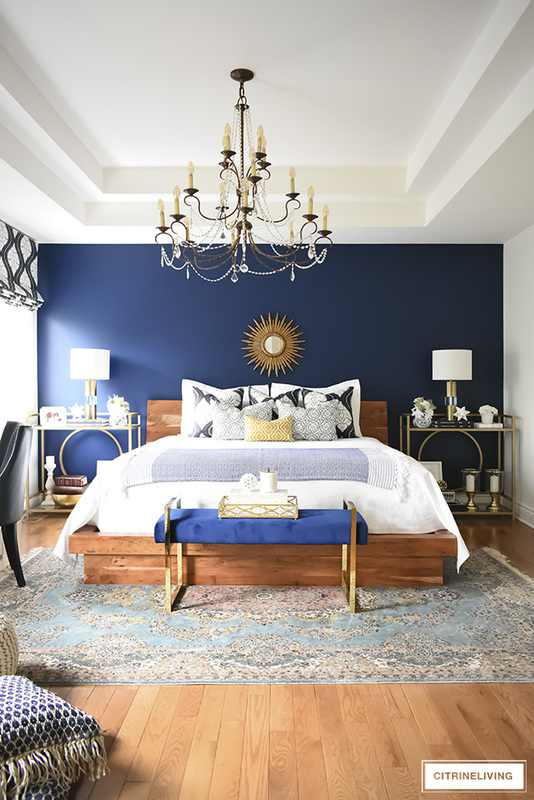 We completely overhauled this room by painting, adding crisp, clean roman blinds, all new furniture and linens, an over scale chandelier and brass details, all to work together with an existing stunning vintage rug. Can you believe these results? I still can’t, no matter how many times I look at these images. It’s such an incredible transformation, and this is most definitely one of my favorite makeovers ever! It wasn’t a low budget one however, but we were very mindful not to overspend and to keep the costs as low as we could. Since this was a true and complete overhaul, it was necessary to spend some money to pull it off. What we did do, was use many items that my friend already owned, like the gorgeous rug, which was a huge bonus. 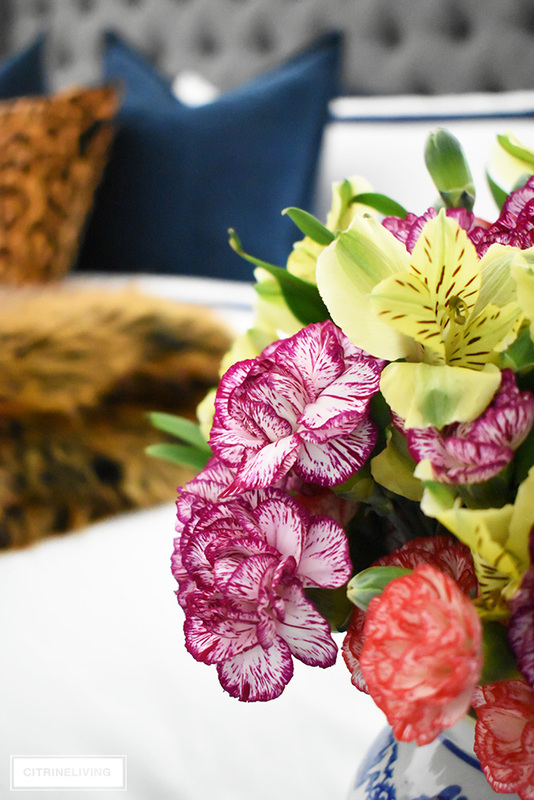 You can check out the full reveal of this gorgeous boho-glam bedroom retreat here. TOP PICKS FROM THE NORDSTROM HALF-YEARLY SALE! WEEKEND FAVORITES: MY PICKS THIS WEEK + FABULOUS SALES! Wow they are all so beautiful! Do you have a live in electrician who changes out all your chandeliers? For me that’s where the cost really goes up in the make overs – changing out the lighting and hiring an electrician. Thank you for the inspiration! Fantastic makeovers! Enjoying the series so much! Lots of pinning going on over here! I just bought a new home and am looking for inspiration everywhere. Big fan of yours (found through instagram) and loving these before and afters! Thank you s much Tara, I appreciate that so much! Thank you for stopping by the blog to say hi!